The mere thought of having to take a required calculus course is enough to make legions of students break out in a cold sweat. Others who have no intention of ever studying the subject have this notion that calculus is impossibly difficult unless you happen to be a direct descendant of Einstein. Well, the good news is that you can master calculus. It’s not nearly as tough as its mystique would lead you to think. Much of calculus is really just very advanced algebra, geometry, and trig. It builds upon and is a logical extension of those subjects. If you can do algebra, geometry, and trig, you can do calculus. In this popular book, Mark Ryan explains calculus in plain English rather than with the kind of technical jargon that’s found in so many math books. Ryan brings difficult and abstract calculus concepts down to earth by showing how these concepts are connected to more ordinary, concrete things. 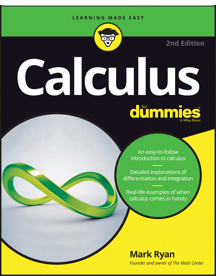 If you find your calculus textbook a bit difficult to follow, this is the book for you. Learning geometry doesn’t have to hurt. With a little bit of friendly guidance, it can actually be fun! 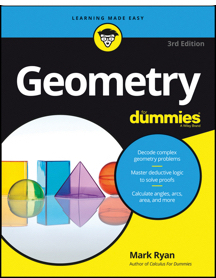 Geometry For Dummies, 3rd Edition, helps you make friends with triangles, rectangles, rhombuses, circles, parallelograms, polygons, pyramids, and prisms. The book eases you into all the principles and formulas you need to analyze these two- and three-dimensional shapes, and it gives you the skills and strategies you need to write geometry proofs. Geometry proofs trip up many students. But once you learn the proof tips and strategies covered in Geometry for Dummies, you’ll realize that proofs aren’t nearly as tricky as they may have seemed at first. You’ll find out how a proof’s chain of logic works  how you move from the given information through interim conclusions and then on to the final conclusion. And you’ll learn some secrets for getting past the rough spots. The non-proof parts of the book contain helpful formulas and tips that you can use anytime you need to shape up your knowledge of shapes: triangles, pentagons, hexagons, circles, cones, cylinders, and so on. You’ll learn how to analyze area, perimeter, volume, surface area, angles, diagonals, and more. And, finally, the book may even give you a feel for why geometry continues to draw people to careers in art, architecture, engineering, carpentry, robotics, physics, and computer animation, among others. From differentiation to integration  solve problems with ease. • Get the inside scoop on calculus shortcuts and strategies. • Try your hand at calculus application problems. where you went wrong (and right!) with a problem. Got a grasp on the terms and concepts you need to know, but get lost halfway through a problem or, worse yet, not know where to begin? Have no fear. This hands-on companion book to Calculus for Dummies, 2nd Edition, walks you through the methods for solving the different types of calculus problems you’ll likely encounter in your class. With just enough refresher explanations before each set of problems, the workbook will help you sharpen your skills and improve your performance. You’ll see how to work with limits, continuity, curve-sketching, natural logarithms, derivatives, integrals, infinite series, and more. 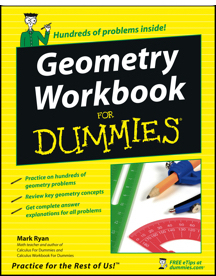 Geometry Workbook for Dummies gives you the opportunity to try your hand at the kind of geometry proofs and two- and three-dimensional non-proof geometry problems covered in Geometry for Dummies, 3rd Edition (see above). The workbook contains over 200 practice problems. Geometry for Dummies, 3rd Edition contains comprehensive explanations of all topics and concepts. The workbook covers the same topics, but its main purpose is to give you practice problems so that you can reinforce the ideas you learned in the main book. But the workbook is not only a collection of problems. Concepts, theorems, formulas, etc. are explained  just much more briefly than in the main book. Some students will want to go through the thorough discussion of ideas in Geometry for Dummies and then turn to the workbook for practice. Other students might want to go straight to the workbook, using the main book only when they want more complete explanations of certain topics. Still other students may choose to do without the main book. 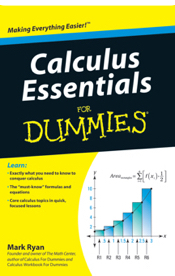 If  like Sergeant Joe Friday of the classic TV show Dragnet  you want “just the facts,” you should pick up a copy of Calculus Essentials for Dummies. It contains all of the important calculus topics, concepts, definitions, and formulas covered in Calculus for Dummies, 2nd Edition (see above), but without the comprehensive explanations. 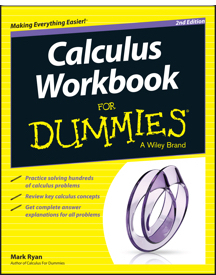 As a result, Calculus Essentials for Dummies is a much smaller and lighter book that can easily fit in your book bag or coat pocket. It’s a great reference book to have for a quick check of critical calc concepts. And it’s not just a collection or list of formulas. All formulas and concepts are explained, and  as in all of Ryan’s books  the ideas are explained in plain English. Geometry Essentials for Dummies contains all of the important topics, concepts, formulas, and proof strategies contained in Geometry for Dummies, 3rd Edition (see above), but without the thorough explanations. It’s a great, pocket-size reference book to keep handy for a quick check of formulas for area, volume, and surface area, properties of triangles, quadrilaterals, and other polygons, geometry proof theorems, postulates, and definitions, etc. 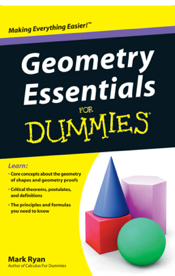 And Geometry Essentials for Dummies is more than just a bullet-list of theorems and formulas. All concepts are explained  just much more briefly than in Geometry for Dummies. 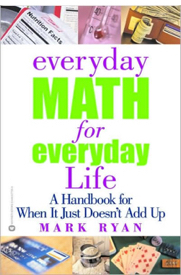 If you find yourself in situations where you wish you knew how to “do the math”  whether to figure a percent discount, to figure your tip, to convert a temperature from centigrade to Fahrenheit, to understand an APR, or to help your kids with math  then Everyday Math For Everyday Life is the book for you. • reading charts and graphs. Everything is explained in plain English, so whether you’ve forgotten the math  or, heaven forbid, never learned it in the first place  you should have no trouble following the explanations. The second half of the book covers roughly 100 situations where knowing the math might come in handy. Say you’re traveling in Europe, and you see that the temperature is 20 degrees centigrade. What’s that in Fahrenheit? Simple: 1) double 20, that’s 40, then 2) add 30, that gives you 70 degrees Fahrenheit. This shortcut method doesn’t give you an exact answer, but it’s close enough for deciding what to wear, etc. You can also learn the math concerning the GNP, the federal deficit, the inflation rate, and the prime rate. There’s a nice shortcut for calculating how long it will take your investment to double in value depending on the interest rate you’re earning. You can learn some shortcuts for converting from metric to U.S. units of measurement. There’s a section on baseball statistics, another on casino game odds, and one about the weather. My guess is that many of these topics will seem easier than you might have thought. I’m confident that you’ll enjoy and benefit from the book.